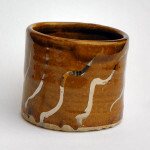 A potter that makes me think of the sea would be Simon Carroll, he altered the patterns in the sand and made his own. The first I saw of his work was at retrospective of his work at the V&A, the work instantly spoke to me, and I am glad I stumbled across it that day. He would probably find my work not bold enough, as I do some days. 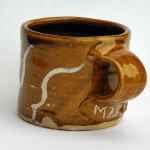 I still have time, this mug doesn’t represent the end of my work only an only going journey. There is an odd kind of combination of qualities here: of precision and irregularity. Speed and care. Earthy colours and metallic glaze. Gritty and glassy textures. 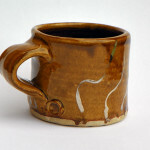 I like this mug and I love knowing something about how it was made and your thoughts that go with it. It is generous, honest and peculiar. We are keeping it on the mantel away from our mass produced mugs, which don’t tend to last long in our house.